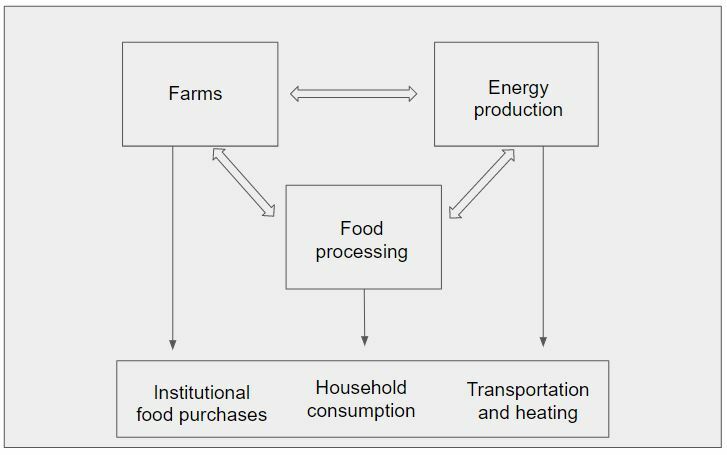 Agroecological symbiosis (AES) is a model where food production is arranged to the mode of industrial ecology and industrial symbiosis. Industrial ecology refers to a concept in which the use of energy and material flows are arranged to resemble those in natural ecosystems. Deriving from this basic concept, industrial symbiosis refers to an arrangement in which the partner industries following the industrial ecology principle are in close physical proximity that allows for localized co-evolution and maximal energetic and material efficiency through it. In being localized, the AES also serve in healing the “metabolic rift” (MR), which is defined as an irreparable rift that affects all the interdependent process of biophysical and social metabolism. Koppelmäki, K. et al (2016) ’Palopuro Agroecological Symbiosis’ A pilot case study on local sustainable food and farming (Finland). In: P. Rytkönen & U. Hård (eds.) Challenges for the New Rurality in a Changing World. 7th Int. Conf. Localized Agri-Food Systems, 8-10 May 2016 Stockholm, Sweden.